One of the very early Fiestaware designs were based on cut-through 'flashed' glass, called Intaglio. Due to their scarcity they are very collectable, but as ruby was a popular	colour in the 1950s, the	blue-flashed	versions	are most keenly sought after. The intaglio range were only produced for a short time and differ significantly from standard	Fiestware. Intaglio handkerchief vases were known to be made around 1957/58, but other glassware had	probably already been superceded by transfer-printed Fiestaware. 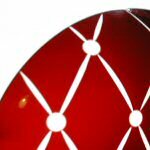 These have a 'flashed' red, white or blue outer layer of glass and the designs were created by cutting through the colour to reveal the clear glass	underneath. As can be seen on the photo (left), the cuts are reasonably deep for just 3mm glass and,	being	hand-cut,	a	great	deal	of control	had	to be exercised	by	the	engraver. The un-engraved blanks were also purchased by other	designers for their purposes. One notable	person was the late Geoffrey Baxter who	used such blanks for his college course work	in	1953. Baxter joined Whitefriars the	following	year and ended as Chief Designer. 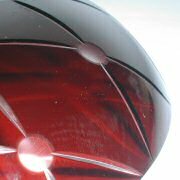 8" oval ruby-flashed	Intaglio	dish, suspected to have been made by Geoffrey Baxter. Chips can devalue the item substantially, although very slight	marks	can	be	less	of a problem. But Intaglio is not like Fiestware, where chips	can	render	certain items worthless, and it can maintain a fairly good price even	with	slight	imperfections. Of	the three colours, the white and blue examples are	the most sought after. Note the white	example shown might not be Chance, although there are known examples of white intaglio	handkerchief vases and dishes. See the Handkerchief Gallery.